Unfortunately, Classic Sports has gone out of business. We no longer carry their parts or products. They were purchased by a company called SportCraft.com. For more information please visit www.classicsport.com. Sorry for the bad news. Game features a glass playing surface for lightning fast play. Includes 4 sanded table soccer balls for better control. Classic Acrylic Foosball Table cabinet walls are 1.5" thick at & above the playing surface and .75" thick below the playing surface. LIFETIME WARRANTY ON GLASS PLAYING SURFACE. Dimensions of the set up foosball tableare: 55 1/2" x 30 1/2" x 34 1/2". Weight is 231 lbs. Dimensions of the playing field are: 46 1/2" x 26 3/4". Assembled Size: 55 1/2" x 30 1/2" x 34"
The main difference between Classic Sport Tables and Tornado is that Tornado is a commercial grade table as found in an arcade which accepts money and has expensive electronics whereas Classic Sport Tables are quality home use tables not designed for arcades and thus less expensive. 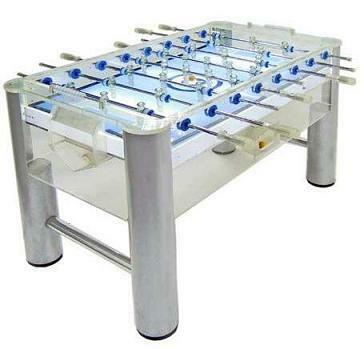 Classic Sport tables are much better than the cheap $300 home foosball tables you find elsewhere. The main things to look for are the way the legs attach to the table (on the outside or inside of the cabinet). All of the Classic Sport tables attach on the inside which makes them stronger and more attractive when putting them into a home. Also when the table is put together it should be very stable and not wobble. View our other different types offoosball tables andhockey tables from Competitive Edge Products, Inc.
Dimensions: 56" x 36" x 9"